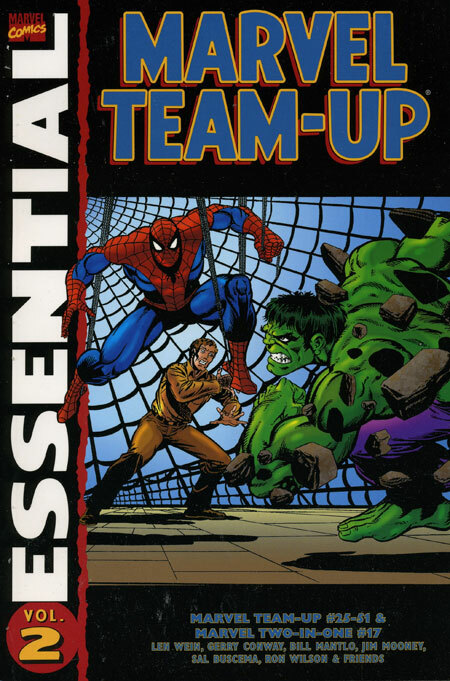 Overview: As a New York City-based character, Spider-Man continues to be the center of attention in the Marvel Universe, and in the pages of Marvel Team-Up, as seen in this second Essential volume. As with the first volume, Marvel Team-Up partners the various Marvel characters with their most recognizable hero in Peter Parker, a.k.a. Spider-Man. While most of these stories are one-and-done, we do see some multiple-issue story arcs. Spider-Man moves from one team-up to the next, all as part of the same story. For example, see the Defenders story in issues #33-#35; a multi-part story focusing on the Vision and the Scarlet Witch in issues #41-#44; and the Iron Man arc from issues #48-#51. This last story arc introduced NYPD Captain Jean DeWolff, one of the few officers that recognize Spider-Man as a hero working with the police, and Jean’s brother-turned-villain, the Wraith. The Human Torch makes the last of his appearances as the lead feature in Marvel Team-Up #36 in this Essential. However, the Human Torch would still cross paths three more times with Spider-Man in this title over the run of the book. What makes this Essential? : Is this really an Essential title? Absolutely not, when looking at the significant moments of the characters’ life stories. However, this title, as well as the other team-up books from Marvel and DC, is the perfect way to introduce a new reader to a world of characters. From this volume, a reader could go explore the adventures of Iron Man, Thor, The Fantastic Four, The Defenders, The Avengers, Doctor Strange, Killraven, and many others. So give this a read and see what interests you next! If you like this volume, try: the Ultimate Marvel Team-Up series from 2001 & 2002. The Ultimate universe was created by Marvel in the early 2000s as a way to tell stories featuring their most popular characters without the 40+ years of continuity weighing them down. The stories mirrored many of the original character stories but told to match the modern society. For example, teenage Peter Parker did get a job at the Daily Bugle, but he was helping out on the paper’s website. For Ultimate Marvel Team-Up, the entire series (16 issues and one special) is written by Brian Michael Bendis, with art from a variety of artists. These issues serve as a way to introduce many Marvel characters into the Ultimate Universe, so the first appearances of Ultimate Hulk, Ultimate Iron Man, Ultimate Daredevil, etc. My personal favorite was issue #14, where Spider-Man crossed paths with the Ultimate version of Black Widow. The art is done by Terry Moore (Strangers in Paradise) who was the perfect choice to show teenage awkwardness of Peter against the sleek beauty of Natasha. The entire series has been reprinted multiple times in multiple formats, so it should not be a challenge to track these issues down. This entry was posted in Human Torch, Marvel Essentials, Spider-Man and tagged Bill Mantlo, Gerry Conway, Human Torch, Jim Mooney, Len Wein, Ron Wilson, Sal Buscema, Spider-Man. Bookmark the permalink. Pingback: Throwback Thursday – Essential Marvel Team-Up Vol. 2 – WORST. COMIC. PODCAST. EVER!